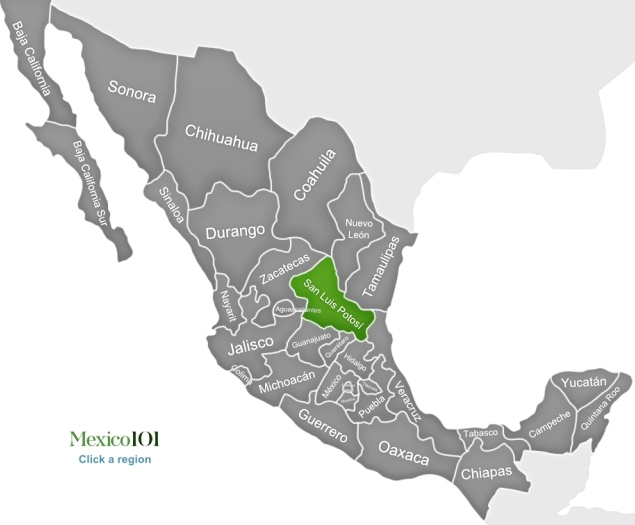 In the north of Central Mexico lies the state of San Luis Potosí, one of the largest regions in Mexico consisting of the self entitled city and the municipalities of Ciudad Valles, Tamazunchale, Rioverde and Matehuala. Once a part of modern day Columbia, San Luis Potosi was originally a very primitive region inhabited by hunter gatherer tribes such as the Otomi and Chichimeca. However, many of these tribes were wiped out with the arrival of the Spanish and following many wars of turbulent war, the region was most famous for a most prosperous economy and at one time, for being the capital of Mexico itself. In a geographical sense the region is divided from the Gulf Coastal Plain and neighboring states by the Tampaon River and mountains. In fact, San Luis Potosí is located high up on the Mexican Plateua and the surrounding landscapes or features are symbolic of the regions diversity. With fertile soil and favorable weather patterns, there is also a strong presence of agriculture in the area where maize and beans can be found growing next to large plantations of cotton and what. Yes, San Luis Potosí is a state rich for many reasons and the addition of tobacco, peppers and sugar plantations are much of the reason for which it has long prospered. . In the low tropical valleys, sugar, coffee, tobacco, peppers and fruit are staple products. During the mid 1600's it was compared to the town of Potosi in Bolivia when they located some copper and zinc mines in the region, a comparison which can still be found today within the name of the state itself. With a population of just under 3 million, a strong education system and an economy which has consistently performed most other parts of the nation, San Luis Potosí is divided into more than 50 different municipalities and they all lie within a different zone - Center, Media, Altiplano and the Huasteca zone. Whether you wish to drive the streets of the city centre or hike amongst the luscious hills in nearby Real de Catorce, there are many attractions in the area to make for a worthwhile visit, and that's not to mention the incredible number of historic buildings to explore such as Teatro de Paz, the Cathedral and La Capilla de Aranzazú. San Luis Potosí is a charming state, where modern times are beginning to catch up on the old world but if you look close enough you will find enough attraction to entice you for a visit and once there, you are likely to find a prosperous city with ample things to do.